Bring Charitable Giving Into Your Estate Plan | Blackstone Valley Wealth Management, LLC. In addition to the altruistic and goodwill benefits any charitable contribution brings, it can also have significant tax advantages. When deciding your estate-planning strategies, consider a charitable contribution to help the charity of your choice as well as provide you with a steady stream of income and potential tax benefits. There are different options for setting up a charitable contribution through your estate plan. The easiest is a simple bequest through your will. Remember that charitable contributions are 100% deductible from estate taxes. What may be even more beneficial for you than a simple bequest is a charitable remainder trust (CRT). A CRT offers flexibility, an income stream for life or a term of years, and significant tax benefits to you and your heirs. A CRT is an irrevocable, tax-exempt trust in which you place assets to provide income for you during a specific period of time (i.e., your lifetime or a term not to exceed 20 years). At the end of that period, the remaining assets will be turned over to the charity of your choice. The trust can be funded with a wide assortment of assets, including bonds, mutual funds, stocks, and real estate. A CRT can offer benefits on a variety of levels. For instance, if you have appreciated assets like stock, you will likely pay a great deal in capital gains taxes when you sell the stock. But if you transfer the stock to a charity through a CRT, the trustee may be able to sell the stock with no gift, estate, or capital gains tax consequences for the donor. The trustee can then set up an investment that will provide an income stream for you, which will be subject to ordinary income taxes and capital gains. Finally, you'll be able to take a charitable income tax deduction based on the present value of the trust's remainder interest. 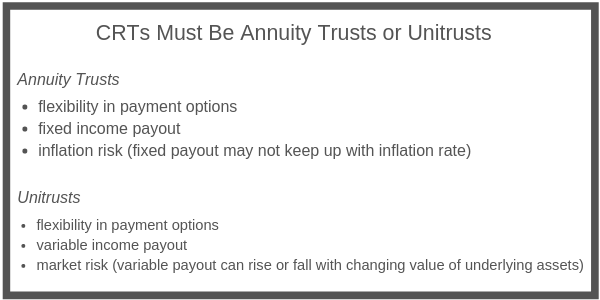 A CRT must be designed in the form of either an annuity trust or a unitrust. Both allow flexibility in payment options. The main difference involves income and fair market value of the assets in trust. Income from an annuity trust is a fixed percentage (not less than 5% or more than 50%) of the initial fair market value of the assets. This type of trust is best used with assets that will be able to generate the required income and do not fluctuate greatly in value (such as bonds). The income to the donor is fixed and will not grow as the asset base grows. Consequently, the income may not keep up with inflation. A unitrust is a more flexible but risky alternative. In a unitrust, the donor still receives a fixed percentage (not less than 5% or more than 50%) of the value of the assets in the trust, but the assets are valued annually, and the donor receives the fixed percentage of the current fair market value. This allows the donor to benefit from any growth in the investment; of course, there are no guarantees such growth will occur. The unitrust also allows for additional contributions to the trust, whereas the annuity trust does not. A unitrust has better potential to keep up with inflation because the income payments will increase if the investment grows in value. However, if the value of the assets in the trust falls due to market conditions, the income also will decrease. In an annuity trust, the donor is guaranteed the same income payment regardless of current asset value and thus is protected from a possible market downturn. Ultimately, the choice between an annuity trust and a unitrust will be dictated by a number of factors as best determined by your advisory team. A CRT can be a little involved to set up. By establishing the trust, you forever relinquish your rights to the assets you put in the trust. Another consideration is that your heirs will not inherit the assets placed in this trust. Some donors compensate for this by purchasing a life insurance policy with some of the income generated by the CRT or by using the savings incurred by the charitable income tax deduction. Though a CRT may sound like the ideal choice for your charitable bequests and estate planning needs, you might also consider these other options. A CLT is essentially a CRT in reverse. Unlike a CRT, a CLT allows you to place in trust assets that will be left to your heirs; however, you specify a set number of years during which a guaranteed amount of a fixed percentage of the value of the assets in the trust will be paid to a charity. You pay discounted gift taxes on assets transferred to the trust and do not receive a charitable deduction. However, your heirs ultimately will receive trust assets free of estate taxes. Another possibility is setting up a foundation allowing systematic gifts to an area of special importance to you, the founder. Foundations can fund college scholarships, research grants, and the maintenance of collections or real estate, among others. Although foundations fell out of favor with some wealthier individuals after the Tax Reform Act of 1969 eliminated some of the tax advantages, they are still highly utilized to preserve and foster an individual's or family's philanthropic legacy. When planning your estate, you should consider making a charitable contribution. In addition to the altruistic benefits of donating to charity, you can also gain significant tax advantages. Though perhaps one of the more popular estate planning tools is the CRT, you might consider the benefits of other options as well. Talk to your financial advisor or legal counsel to determine which option is right for you.